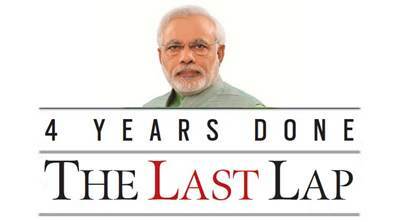 The Last Lap: When the Narendra Modi-led government came to power in May 2014, the UPA government had electrified about 1.05 lakh villages out of 1.25 lakh villages that were unelectrified in 2005. The Last Lap: A comprehensive turnaround in the financial health of state Discoms under UDAY scheme still in the works. Last month, the government achieved its target of 100 per cent village electrification 12 days ahead of the deadline. Now, with general elections just one year ahead, it is eyeing 100 per cent household electrification by the end of 2018. The original deadline to complete household electrification was March 31, 2019. 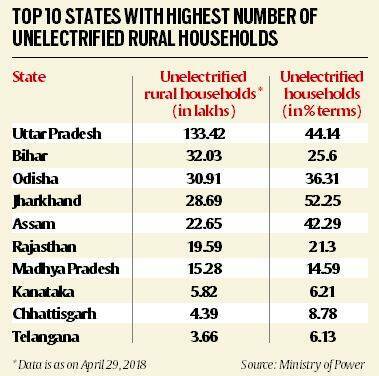 When the Narendra Modi-led government came to power in May 2014, the UPA government had electrified about 1.05 lakh villages out of 1.25 lakh villages that were unelectrified in 2005. In 2014-15, before Deen Dayal Upadhyaya Gram Jyoti Yojana (DDUGJY) begun, only 1,405 villages were electrified. In November 2015, the Union Cabinet approved DDUGJY for rural electrification of around 18 thousand unelectrified villages. With village electrification complete, household electrification has become the priority. Apart from Odisha and West Bengal, all other states have joined the Ujwal Discom Assurance Yojana (UDAY) scheme, started by Centre to improve the financial and technical health of states’ power distribution companies. However, a comprehensive turnaround is likely to take some time. Four months into the Modi government, the coal sector faced a major shock when Supreme Court cancelled allotment of 214 coal blocks. The coal supply, as a result, was sub-optimal in 2014. Centre was able to improve coal supply during 2015 and 2016, leading to increase in power generation. However, in the last 8-10 months, several power plants do not have adequate amount of average coal stock. With summer in full flow and spot power prices reaching new heights due to huge demand, Centre is struggling to combat the coal situation. * With electricity reaching Manipur’s Leisang last month, Centre has announced the completion of electrification of all villages in the country. The Prime Minister had promised in his Independence Day speech in 2015 that his government would bring electricity to all villages within 1,000 days. * Between 2014 and 2017, there has been a 27.58 per cent increase in length of the transmission lines. It increased from 2.9 CKM (circuit km) in March 2014 to 3.7 CKM in March 2017. The national power grid has not witnessed a major disturbance in last four years. * To promote energy-efficient lighting, Prime Minister Modi launched National LED programme in January 2015 that has two components — Unnat Jyoti By Affordable LEDs for All (UJALA) and Street Lighting National Programme (SLNP). Around 30 crore LED bulbs have been distributed under UJALA. Approximately 45 lakh LED bulbs have replaced older bulbs under SLNP. * Ministry of Power, through Energy Efficiency Services Limited (EESL), is pushing electric vehicles (EV). EESL issued India’s first tender for procurement of 10,000 EVs in August 2017. Tata Motors recently rolled out its first batch of EVs for EESL, which plans to acquire 20,000 EVs by March 2019 with an investment of Rs 2,400 crore. * Currently, around 16 per cent of the rural households are unelectrified. Last September, Centre launched the Pradhan Mantri Sahaj Bijli Har Ghar Yojana (Saubhagya) scheme to ensure electrification of all “willing” households in rural and urban areas. The states and Union territories are required to complete household electrification by December 31, 2018. * While most states have signed the UDAY scheme, and 86.29 per cent of the cumulative debt of states’ distribution companies has been issued as bonds so far, they are still far from initiating the comprehensive operational turnaround envisaged in the scheme. Under the scheme, states would have to meet certain targets — such as tariff hike, rural electrification, urban power reforms, bringing down AT&C (Aggregate Technical and Commercial) losses, among others. Out of the 27 states which are part of UDAY scheme, 25 have implemented tariff revision and the Cost of Supply to Revenue Realisation (ACS-ARR) stood at 26 paise. * Coal supply situation improved in 2015 and 2016. However, in the last 8-10 months, the situation has deteriorated, seriously affecting the power sector. On May 18, 2018, Railway Board wrote to all its zones that “in view of the critical coal stocks with power plants, Ministry of Power has requested for granting of higher priority in loading of coal for power houses from goods sheds so as to facilitate higher supply of coal to power sector”. Railway Board stated that this higher priority of coal supply should be accorded till June 30. However, this decision to divert coal supply to independent power producers has been strongly opposed by Indian Captive Power Producers Association (ICPPA). * Of the sanctioned Rs 27,146 crore for the Integrated Power Development Scheme (IPDS) projects, around Rs 5,128 crore has been approved. IPDS scheme is for establishing infrastructure for “quality and reliable 24 hour power supply” to urban households. While the Centre has designed and allocated record budget for this scheme, states have been slow in execution. * In the past six years, no fresh long term power purchase agreement (PPA) issued by any state, apart from Uttar Pradesh and Kerala. * According to Association of Power Producers (APP), there are currently over 80,000 MW assets, either under operation or under construction, which are severely stressed due to reasons like lower availability of coal supply, lack of long-term PPAs, huge delays in regulatory orders and receivables from distribution companies. Jyotiraditya Scindia, Former Power Minister: “The fact is that on the distribution side, this much touted UDAY has fallen flat on its face… You have almost 30,000 MW of power that’s come on stream but PPAs are not being signed. Also, all the current IPPs (independent power producers) are powering down the PLFs (plant load factor). The PLFs that used to run at 75-90 per cent are running today at 60 per cent because there is no offtake”.